Love customised, one-of-a-kind clothing? Then you’ll be glad to know that the city’s home to dedicated (wholesale and retail) fabric markets. Take a trip to these places to score fabric of all hues and designs that will make for fab wardrobe additions. Recommended for: This one’s a no-brainer. Possibly Bangalore’s most favourite place for a shopping spree, Commercial Street and its surrounding areas are lined with cloth stores. On the main street, walk into stores like Fazals and Sterling House for flowy synthetics, soft cottons and embroidered fabric. If you are looking for bargain buys, just hop over to Ibrahim Sahib Street that runs parallel to Comm Street. Over there, check out places like Silver Plaza (near Sagar Chaats) for plain material for your salwars, satins, brocades and, even, cloth adorned with heavy work that’s perfect for weddings or a festive occasion. Walk down the street (towards Shivajinagar), and you’ll find lots of stores exclusively for dupattas. And for really beautiful, traditional silk fabrics such as Chanderi, Patola, Brocade and more, Mysore Saree Udyog is your one-stop-shop. Recommended for: Wear a pair of comfy shoes and gear up to navigate the bustling Avenue Road and the maze-like Chickpete. With its unending wholesale shops, it’s a trip worth taking. All along the road, you’ll find hawkers calling out to you, to come in and check out their unending range of sarees (they’ll have everything from Kanjivarams to Tussars), bolts of printed fabrics, and blouse material. Don’t think twice about venturing into the astonishingly narrow lanes to find a shop that will have just what you are looking for. Though the rates are already slashed down, get bargaining till you hear a price you like. Recommended for: Shop by the kilos at RC Puram (the other end of this seemingly endless market is Bandireddy Circle). This wholesale marketplace will have you swooning. Piles of denim, hakoba, and airy cottons can all be found in tiny shops and on the streets itself. While you’ll have to spend a little time picking through the mounds, you’ll surely walk away with a steal that’s going to make your wallet very happy. Recommended for: Start off at OPH Road (it runs perpendicular to Commercial Street), there you check into shops like Kohinoor to get your hands on cotton fabrics and lining material. Meander down the road, and you’ll see shops selling everything from curtain materials to shimmery sequinned fabric. Your next stop should be Palace Theatre Road (down the road from Taj Hotel). On either side, you’ll see stalls selling printed cottons and suiting. The old Palace Theatre has now been replaced by a glitzy plaza. Right next to it, you’ll see a long line of makeshift stands from where you can buy soft synthetics with gorgeous prints and satins. On the opposite side of the road, there’s a small lane with plenty of shops that sell intricate laces, sequins, buttons, and threads of all kinds. 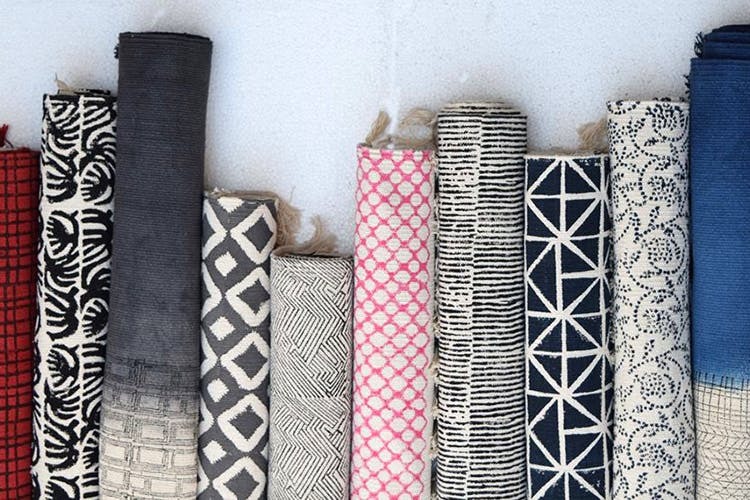 Recommended for: South Bangalore’s most famous marketplace is home to some great fabric stores. If you peek past the rows of vegetable and flower stalls that crowd the footpath, you’ll notice shops selling grand silks, pretty cottons, blouse materials of all kinds, and colourful synthetics that will brighten up your wardrobe. Recommended for: Getting married and need the perfect suiting material? Head out to BVK Iyengar Road for a splendid shopping experience. You’ll find rows of shops selling suit material that range from sedate to downright flashy. The brides need not feel left out there, as this lengthy shopping street is dotted with emporiums that sell Mysore silks, Kanjeevarams, and heavy Banarasi and brocade material.